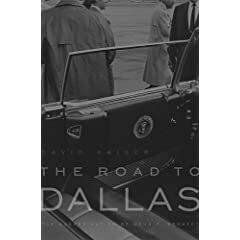 David Kaiser’s The Road to Dallas, as John McAdams’s review makes abundantly clear, is scarcely different from dozens of conspiracy-mongering books on the Kennedy assassination that have been published in the last 44 years. The over-ingenious fantasy Kaiser conjures up—that the mob, anti-Castro Cubans, and right-wingers conspired to kill Kennedy—is better written than some of the buff literature, viz., A Farewell to Justice, Joan Mellen’s hagiography of Jim Garrison. Yet ultimately, The Road to Dallas exhibits all the familiar defects of the conspiratorial mindset. Kaiser is credulous about the dubious, and skeptical about the obvious. Still, Kaiser’s book arguably deserves to be in the public marketplace of ideas, despite the small amount of genuinely new material in it. Given the conceptual quality of the book, however, one would think a second-tier publisher was responsible for foisting it onto the public. Instead, the name on the spine is Belknap Press, the prestigious imprint of Harvard University Press (HUP), one of the most venerable academic publishers in the nation—and this is what sets Kaiser’s book jarringly apart. Neither Kaiser nor HUP was willing to answer questions about the editorial vetting The Road to Dallas underwent. “Any such questions would have to be addressed to the Press,” Kaiser responded when asked, and HUP refused to disclose information about its editorial process in general, or as it pertained to Kaiser’s book specifically. Indeed, insofar as HUP is concerned, the rotating membership on its Board of Syndics—or what other university presses call their editorial or publications committee, and readily make public—is top secret. Some reticence and confidentiality about the editorial process, of course, is understandable and normal. Peer-review can be highly politicized, and no author would relish having the process laid bare for everyone to ponder. The published book, after all, is what finally matters, not the sometimes twisted and torturous path to publication. Still, when a press as distinguished as HUP publishes a book that makes a bald claim about a controversial matter—“the assassination . . . was an appalling and grisly conspiracy”—some transparency would seem advisable. Put another way, if HUP were to put its reputation on the line by publishing a book that “proved” 9/11 was an inside job, wouldn’t some kind of explanation be in order? Before HUP’s editorial process is explored, one of the fictions at the heart of Kaiser’s book merits exposure. Finally, a historian, without preconceptions, has looked at the voluminous, once secret documents produced by the CIA, the FBI, and other government agencies in response to the JFK Assassination Records Act of 1992. Kaiser’s nuanced conclusions on Oswald’s guilt and the ominous issue of conspiracy will command respect from even those who disagree with them. Yet, far from being someone who began the project without a predisposition, Kaiser has demonstrated a bias toward a conspiratorial explanation for at least 25 years, and HUP surely knew about his predilection when it undertook the project in 2004. As Kaiser notes in the book’s acknowledgments, his first article on the assassination was written in 1983, at the behest of his brother, who was then editor of The Washington Post’s “Outlook” section. On the 20th anniversary of the assassination, Kaiser exhibited none of the certitude about “whodunit” that he would later come to have. Still, his initial analysis revealed a deeply-seated proclivity to conspiratorial explanations, specifically, that Oswald “had confederates,” and that no theory, least of all the Warren Commission’s findings, “fits all the facts.” To help make his argument, Kaiser egregiously misrepresented what steps were taken, and why, within the federal government in the hours and days immediately following the assassination. Indeed, Kaiser did not even bring clarity to the incontestable proposition that Oswald fired all the rifle shots, and was responsible for all the felonies, in Dealey Plaza.
. . . the evidence boils down to possibilities and vague probabilities. Oswald may have been part of a large conspiracy or a very small one; he may have even acted alone. The full truth would have been difficult to discover even in 1963-64; now it is probably lost to us forever. It should be said outright that anyone who adopted this position in 1983 was already choosing to be willfully ignorant of the body of evidence condemning Oswald, and Oswald alone, as the assassin. Cogent evidence against conspiracy and for Oswald’s mental instability (he was a politicized sociopath) existed in records available at the time. These included a psychiatric history from the period when Oswald lived in New York city in the early 1950s, and the book Marina and Lee, published in 1977, which contained extensive descriptions of Oswald’s gravely troubled personality as provided by his widow. But Kaiser’s mind was open only to the exact nature of an alleged conspiracy, not to the question of whether there was one in the first place. The passage of more time was hardly going to tip the balance against Oswald to anyone still dissatisfied by the overwhelming weight of the evidence against him in 1983. Kaiser returned to the subject of the assassination in a 1997 essay written for the journal Intelligence and National Security. Kaiser’s penchant for investing peripheral events with enormous meaning (even when it is not clear they took place) was on full display in this review of five assassination-related books. A key point in the essay concerned the on-going work of the Assassination Records Review Board (ARRB), which, as Kaiser acknowledged, had a very important job to do: to gather, from every nook and cranny of the federal government, all records deemed pertinent to the assassination, regardless of classification level during the recently ended cold war. The viewpoint Kaiser now embraced was barely distinguishable from the one long espoused by G. Robert Blakey, the former staff director and chief counsel of the House Select Committee on Assassinations (HSCA). Indeed, Blakey could be said to have invented it. He was the intellectual author of its first iteration in the 1979 HSCA final report, and subsequently co-authored two books that featured the identical intellectual construct: Oswald committed the physical act, but President Kennedy was “probably” assassinated as a result of a conspiracy involving organized crime figures and anti-Castro Cubans—although there was insufficient evidence to indict anyone, even posthumously. The book he had in mind, Kaiser made clear, would not occupy either of the supposed extremes in the controversy over the assassination. It would be neither a written version of Oliver Stone’s fantastical JFK, nor a do-over of Gerald Posner’s “rehash” of the Warren Report. Instead, and not surprisingly, Kaiser staked out what might be termed a modified position from the Blakey school, although one still safely within the fold. Oswald physically killed JFK after having been recruited into a conspiracy. Kaiser claimed, moreover, to have already assembled sufficient documentation “to make an airtight connection between organized crime, right-wing elements, and anti-Castro Cubans.” Right-wingers represented the new twist. Kaiser was well-positioned to make an argument for a scholarly book on the assassination. For one, he had the credentials: a PhD in history from Harvard (1976), and sole authorship of four books and co-authorship of one, all of them published by respected university presses. One of the books, American Tragedy: Kennedy, Johnson, and the Origins of the Vietnam War, even covered the same time period as the Kennedy assassination, and another, Postmortem, also involved a controversial political crime, namely the Sacco and Vanzetti case. But the main selling point of Kaiser’s 25-page proposal, entitled “End Game in Dallas: The Assassination of John F. Kennedy,” was the release of “thousands of pages of hitherto untapped original FBI, CIA, and House Assassinations Committee documents on every aspect of the Kennedy assassination.” It was this enormous trove of new documents, made available because of the ARRB’s unprecedented efforts from 1994 to 1998, but not yet exploited by any credentialed historian, that made the case for the book. The general absence of academic books, and the obsolescence of Michael Kurtz’s 1993 edition, also worked in Kaiser’s favor. When critic Scott McLemee asked about the book’s genesis, Kathleen McDermott, one of Kaiser’s editors, insisted that the book “went through a standard acquisition process at the Press,” yet also acknowledged that familiarity with Kaiser had played a role. “Partly it was a matter that we knew him,” McDermott told McLemee. “And partly it was because this is a topic that engages people so emotionally that to have a book like this come out from the Press seemed worthwhile.” So it’s at least conceivable that because Kaiser was a “proven Harvard” author (as HUP editors sometimes call scholars who have written more than one book for the Press), what would become The Road to Dallas was signed up with little outside review. Whatever happened at HUP, in any case, was quite distinct from the reception given Kaiser’s proposal by the Oxford University Press (OUP), which presumably received the same proposal. OUP farmed out the proposal to at least one reviewer in February 2004, namely this author. After reading it but before writing up an evaluation, I was informed by the OUP acquisition editor not to bother. Oxford had decided not to offer a contract to Kaiser regardless of my opinion of the proposal. The critical hurdle for any book published by an academic press, of course, is the blind peer-review that occurs once the author submits a finished manuscript. It is typical for at least two readers to function as outside reviewers, although some presses prefer three to avoid split decisions. At HUP, the norm is to have two reviewers, both “very knowledgeable about the subject matter.” Most presses, including HUP, allow an author to suggest one of the referees, although there is no obligation to use the nominee, and at HUP, the person cannot be a mentor of the author. Some presses also ask an author for anyone who should not be asked, because of some on-going feud that might prompt a savage and unfair review. The number of elements that reviewers take into account varies with the nature of the book. But several are considered inviolate. They include factual accuracy; the novelty of the argument being presented; whether the book is well-nested in the pertinent literature and takes it into account, especially if the book departs from conventional wisdom; whether the argument is logical and well-supported, either by the relevant literature or by the author’s marshaling of evidence; if the author’s research is up-to-date; how the proposed book compares to what are regarded as the best books on the subject; and whether the author achieves the stated aims. A book that promises to be controversial, however, ordinarily gets tougher scrutiny in the form of added peer reviews, according to editors at other leading academic presses. Washington Decoded interviewed editors at the university presses at Yale, Columbia, MIT, and NYU, and asked them to describe their process for publishing a book they knew in advance took a provocative stand. These editors responded by describing the additional steps they would take to insure that such a manuscript merited publication, and in one case, shared specific examples. It is almost too easy to speculate as to what really happened. There is no question that Kaiser is well-versed in the documentary record. Blessed with a capacious memory, he matches or exceeds the ability of any conspiracy theorist to recite an unending stream of names, dates, places, and ominous “connections.” (As Thomas Jones, a contributing editor at the London Review of Booksobserved in 2005, “The first rule when concocting a conspiracy theory is not to make any claims that can be proved not to be true . . . . A decent conspiracy theory is made up of hard facts; the invention lies in drawing the connections.”) If Kaiser’s editors, Kathleen McDermott and Susan Wallace Boehmer, ever dared challenge him, he could have easily bamboozled them with his knowledge of facts and how they were ostensibly connected. More likely, they were simply deferential to a “proven Harvard” author. When it came time to expose the finished manuscript to peer review, though, HUP faced a dilemma. If the book were shown to a non-conspiracy theorist knowledgeable about the assassination, then the Press risked getting back a review that would eviscerate the book’s scholarship and findings. From the perspective of a learned reviewer, there would be no way Kaiser’s book could meet the bedrock tests for a scholarly book: a respect for facts; commitment to logical argument; and the acknowledgment of the work of others. Take the hurdle of being well-nested in the literature, for example. The most recent and acclaimed reiteration of the Warren Commission’s findings is Vincent Bugliosi’s 1612-page exhaustive tome, Reclaiming History, a labor that took the author nearly 20 years to complete. Kaiser was certainly aware of Bugliosi’s 2007 book because Kaiser invoked it when it supported his view on one point. The rest of the time, Kaiser simply ignored everything Bugliosi had to say on the very issues on which Kaiser rested his thesis, as if the balance of what Bugliosi wrote simply didn’t matter. After reading the manuscript, no knowledgeable peer reviewer could honestly claim that Kaiser forthrightly addressed, and persuasively disposed of, the arguments of those who support the official story. Who peer-reviewed the book for HUP remains a mystery. However, it is not difficult to find historians, in and outside the academy, whose knowledge of the assassination is so scant they would be hoodwinked by Kaiser’s representation of how certain facts fit together. It’s a consequence of the absence of scholarship: widespread avoidance has led to equally widespread ignorance among historians of 20th century America. Otherwise, how does one explain the likes of Douglas Brinkley and Lloyd Gardner enthusiastically endorsing a book that claims there was a federal cover-up of an obvious JFK conspiracy, and that the assassination was probably organized by anti-Castro reprobates in the CIA? These same historians would not lend their names, presumably, to a book that similarly misused evidence to claim that Franklin D. Roosevelt knew about the Pearl Harbor attack in advance. In response to HUP’s claim that The Road to Dallas underwent the “standard acquisition process,” one might argue that given the audacious nature of the book, and its admixture of fact and speculation, it ought to have been exposed to the most rigorous, if not unprecedented, scrutiny. That certainly did not happen by HUP’s own admission. Instead, it appears that HUP may have resorted to peer-review shopping, with HUP subtly putting a thumb on the scale so as to achieve the desired result from outside readers. Skewing the peer-review process to yield positive critiques was the most important hurdle to be overcome, but only the penultimate step. The last obstacle was HUP’s Board of Syndics, which functions as the final check before publication. Membership on the board rotates and is considered a service to the Harvard community, if not a mark of distinction; it’s an all-Harvard affair. The current board reportedly boasts such academic luminaries as China scholar William Kirby, the Geisinger professor of history, who formerly chaired Harvard’s History Department and served as dean of the Faculty of Arts and Sciences. Most of the scholarly disciplines are represented, although history tends to be over-represented, albeit not in terms of the percentage of HUP books devoted to that discipline. Usually, there is at least one distinguished Americanist on the board. At its monthly meeting, the panel reviews from 10 to 20 manuscripts proposed for publication. Syndics, according to one current member, don’t actually read the manuscripts before they are presented at a meeting, nor are they expected to, although they certainly can insist upon doing so. Rather, their decisions largely ride on the reviews written by the two outside referees retained by the Press; in essence, the HUP board functions as a check or control on the vetting process, reviewing the reviewers. In the vast majority of cases, approval by the Board of Syndics approaches a formality because HUP editors do not normally bring books before the board that are “highly problematic,” according to one syndic. But the obverse also happens on occasion. The panel will decide not to publish a manuscript even after it has received positive peer-reviews. The perception fostered by university presses (and HUP is no exception) is that these publication committees operate with due diligence and the highest of standards. But they would not be human institutions if they were exempt from impulses honed by human frailties, whether in the form of plain inattention or severe bouts of political correctness. A more realistic glimpse into how these boards sometimes dysfunction, and fail in their oversight of the vetting process, came to the attention of this author in 1994.
. . . [I]t was my first meeting of the UC press board, I did not know the folklore, and was quite conscious of being a rookie. The editorial staff not knowing me . . . the book manuscript was assigned to a sociologist much loved by all on the board (including, I must say, me). He presented this manuscript and recommended publication. I smelled big problems in the documentation, and opposed it. The vote went strongly against me. When the book actually came out, I read it for the first time, and was angry at myself for not making some sort of Last Stand. I have spent . . . years on the board attempting to reduce ideological judgments, and to raise the threshold. So have others, and I think we do a pretty good job. That was our un-finest hour. All involved tend to admit it. I didn’t do my job that day, fully, and it is instructive to find my reputation hurt by association with such a moment in a group decision. Live and learn . . . If what happened 15 years ago at UC Press is any guide, it is fairly easy to imagine how a similar, and stunning, lapse of judgment occurred on the Board of Syndics, even though group-think, and a vaguely leftist, paranoid ideology, are not usually associated with the most prestigious university on the Eastern seaboard. Did the board exercise its prerogative to make any demands or recommendations? Did it insist on reading more than the standard number of peer-reviews, or ask for a review by a particular expert? Apparently not. The syndic who spoke to Washington Decoded did not recall The Road to Dallas as having been discussed at more than one board meeting. It matters greatly, of course, that HUP has lent “its cultural authority to a work of conspiracy theorizing,” as McLemee wrote. The Harvard imprimatur undoubtedly played some role in The Chronicle of Higher Education’s otherwise inexplicable decision to publish an article on March 28 adapted from Kaiser’s book. The Chronicle excerpt, which inadvertently carried the ironic title “New Insights Into Kennedy’s Assassination,” began with the Sylvia Odio incident, which is surely one of the most warmed-over, bogus stories in the entire buff lexicon of supposedly over-looked facts. Such is the level of ignorance and gullibility at a leading journal because of the dearth of real scholarship on the Kennedy assassination. In a larger sense, then, this episode underscores again that the historical profession has taken what amounts to a dive on the Kennedy assassination. Future historians of 20th century America will be mystified about why such a watershed event received little attention from scholars—why, out of hundreds of books about the assassination, only a tiny fraction were published by university presses, nearly all of them written by trained historians who were conspiracy theorists. Despite the vast literature about every conceivable aspect of the Kennedy and Johnson administrations, the assassination—clearly, the single, shattering event that defines both presidencies, for better or worse—is treated as a disconnected afterthought in most works about the Kennedy administration, and as a necessary but essentially meaningless prelude to any story involving LBJ, even though the assassination is no less central to understanding the Johnson years than the Vietnam war. Of course, on one level it is easy to understand why trained historians have kept the matter at arm’s length: they are excessively leery of a highly-contested subject, one in which even the simplest statement of fact can be twisted like a pretzel by any assassination buff. As the late Arthur M. Schlesinger, Jr., once remarked, historians consider the assassination “a quagmire” because “any historian trying to get to the truth . . . is bound to sink into a quicksand of suspicions, contradictions, and enigmas.” The consequence of this dereliction of duty has been to leave the field wide open to the fervid imagination of conspiracy buffs, and now, apparently, the disease that is the paranoid style has seeped into the highest reaches of the academy. Kaiser’s vaporous account will be forgotten soon enough, despite its claim to expose “how a conspiracy of mobsters and misfits got away with assassinating a president.” As for HUP, which enthusiastically embraced what H.L. Mencken once called the “virulence of the national appetite for bogus revelation,” the blot on HUP’s copybook, and on the university from which HUP is inseparable, will long endure. While being published by HUP is prestigious, the Belknap imprint confers special status. Funded by an endowment, it is reserved for “books of long-lasting importance, superior in scholarship . . . chosen whether or not they might be profitable.” “A Brief History of Harvard University Press,” HUP website. The Belknap designation is reportedly made by the HUP editorial staff with the consent of the Board of Syndics. Scott McLemee, “The Truth? I Can’t Handle the Truth!” Inside Higher Ed, 19 March 2008. The first academic press book to dispute the Warren Report was Howard Roffman’s Presumed Guilty: Lee Harvey Oswald in the Assassination of President Kennedy (Rutherford, NJ: Fairleigh Dickinson University Press, 1975). But Roffman was not a credentialed historian, so the first such book by a trained historian was Michael L. Kurtz’s Crime of the Century: The Kennedy Assassination from a Historian’s Perspective (Knoxville, TN: University of Tennessee Press, 1982), a second edition of which was published in 1993. That same year the University of California Press published a book by a UC English professor, Peter Dale Scott, Deep Politics and the Death of JFK. More recently, the University Press of Kansas has published several books, including David R. Wrone’s The Zapruder Film: Reframing JFK’s Assassination (2003); Gerald D. McKnight’s Breach of Trust: How the Warren Commission Failed the Nation and Why(2005); Michael L. Kurtz’s The JFK Assassination Debates: Lone Gunman versus Conspiracy (2006). Wrone and McKnight are also credentialed historians. Peter Givler, “Scholarly Books, the Coin of the Realm of Knowledge,” The Chronicle of Higher Education, 12 November 1999. Givler is executive director of the Association of American University Presses, to which HUP belongs. Kaiser email to Holland, 8 March 2008. “Harvard University Press does not publish an annual report, and information on our Board of Syndics is not made public.” Mary Kate Maco, HUP publicity director, email to Holland, 5 March 2008. The no less prestigious presses at the universities of California, Johns Hopkins, MIT, Princeton, Stanford, and Yale either routinely publish the rosters of their publication committees or make them available on request. Kaiser’s article was one of four commissioned to appear on the 20th anniversary of the assassination, in an “Outlook” issue almost wholly given over to the impact of November 22, 1963. The other two articles on the front page were not about the assassination per se, but about the Kennedy legacy and the course the Vietnam war might have taken if Kennedy had not died suddenly. In addition, the section featured columns pertaining to the 20th anniversary by Mary McGrory, Joseph Kraft, David Broder, and George Will. Kaiser dismissed the Warren Report for allegedly “accept[ing] everything tending to confirm the theory (emphasis added) of the lone assassin, while ignoring or explaining away contrary evidence.” Kaiser, “Did Oswald Act Alone? We Evaded the Truth Then, And Now It Can’t Be Found,” WP, 20 November 1983. Kaiser wrote that within hours of the crime, “three of the nation’s most powerful men—FBI Director J. Edgar Hoover, President Lyndon B. Johnson, and Attorney General Robert F. Kennedy—had concluded that [Lee Harvey] Oswald’s background and connections raised questions they did not wish to be answered.” Ibid. There was no basis for making such a claim in 1983, and documentation that has since come to light—especially Lyndon Johnson’s telephone conversations—provides irrefutable proof that Kaiser’s speculative assertion was false. See, in particular, LBJ’s conversations with J. Edgar Hoover, CIA director John McCone, former CIA director Allen Dulles, and Senator Richard B. Russell (D-Georgia) during the week of 23-30 November 1963 in Max Holland, The Kennedy Assassination Tapes: The White House Conversations of Lyndon B. Johnson regarding the Assassination, the Warren Commission, and the Aftermath (New York: Knopf, 2004), 68-74, 92-96, 106-107, 135-159, 166-168, 195-208. Kaiser, “Did Oswald Act Alone?” WP, 20 November 1983. Kaiser’s conspiratorial bent appears to stem from a roseate view of JFK. Reviewing Kaiser’s 2000 book, American Tragedy: Kennedy, Johnson, and the Origins of the Vietnam War, a critic observed that Kaiser’s general thesis could be summed up as, “Kennedy good, Eisenhower and Johnson bad.” Gideon Rose, “Who Set Up the Dominoes?” NYT, 14 May 2000. Priscilla Johnson McMillan, Marina and Lee (New York; Harper & Row, 1978). Philip Shenon, “Who Killed John Kennedy? After 25 Years, More Theories Than Certainty,” NYT, 18 November 1988. As he would later do in The Road to Dallas, Kaiser cited an alleged encounter between Oswald and Sylvia Odio as being absolutely central: “a tantalizing, highly controversial incident, whose proper interpretation probably holds the key to the assassination.” Kaiser, “Intelligence and the Assassination of John F. Kennedy,” I&NS, Vol. 12, No. 4 (October 1997), 188. Kaiser, “Intelligence and the Assassination,” I&NS, 166, 186, 194. The HSCA final report adopted the formulation that neither anti-Castro Cuban groups, “as groups,” were involved in the assassination, nor was the national syndicate of organized crime “as a group.” But the “available evidence does not preclude the possibility that individual members [from both groups] may have been involved.” US House of Representatives, Report of the Select Committee on Assassinations, 95th Congress, 2nd Session (Washington, DC: US GPO, 1979), 1. In his own books, freed from committee restraints, Blakey was less circumspect. A “violence-prone, pro-Castro Oswald [and] an alliance of anti-Castro and underworld figures whose common bond was a hatred of the US president . . . . were the elements that matured into the conspiracy that succeeded in November.” G. Robert Blakey and Richard N. Billings, The Plot to Kill the President: Organized Crime Assassinated JFK (New York: Times Books, 1981), 365. The saga of how the HSCA came to its conclusion that JFK “was probably assassinated as a result of a conspiracy” is worth a book in itself. Briefly, every reliable fact developed by the House investigation fully supported, and even enhanced, the findings of the Warren Commission. David Kaiser, “End Game in Dallas: The Assassination of John F. Kennedy,” undated proposal, 24-25. Kaiser, “End Game in Dallas,” 1. This assertion seems to have been an effort to answer what HUP calls the “Passover question,” i.e., in a book proposal an author is advised to describe “why this book is different from all other books” on the same subject. “Manuscript and Book Proposal Guidelines,” HUP website. In chronological order, Economic Diplomacy and the Origins of the Second World War: Germany, Britain, France and Eastern Europe, 1930-1939 (Princeton, NJ: Princeton University Press, 1980); Postmortem: New Evidence in the Case of Sacco and Vanzetti (Amherst, MA: University of Massachusetts Press, 1985, co-authored with William Young); Politics and War: European Conflict from Philip II to Hitler (Cambridge, MA: Harvard University Press, 1990); Epic Season: The 1948 American League Pennant Race (Amherst, MA: University of Massachusetts Press, 1998); American Tragedy: Kennedy, Johnson, and the Origins of the Vietnam War (Cambridge, MA: Belknap Press, 2000). David Kaiser, “End Game in Dallas,” 1. “Manuscript and Book Proposal Guidelines,” HUP website. McLemee, “The Truth,” Inside Higher Ed. It’s possible that another reviewer retained by Oxford had already weighed in, and that this opinion was so negative that OUP decided not to bother with a second review. Holland interview of HUP representative, American Historical Association annual meeting, 5 January 2008. Clay Morgan, MIT Press senior acquisitions editor, email to Holland, 18 March 2008. Holland interviews with Eric Zinner, assistant director/editor-in-chief, New York University Press, 11 April 2008; Jennifer Crewe, associate director/editorial director, Columbia University Press (CUP), 6 March 2008; Clay Morgan, senior acquisitions editor, MIT Press, 5 March 2008; Jonathan Brent, editorial director, Yale University Press (YUP), 27 February 2008. Crewe, for example, said that when CUP believes a book is provocative, it increases the number of peer-reviews. “[In such a case] you do want to cover your bases so that if there is . . . any controversy, the press can say, ‘Look, we consulted ten different reviewers.’” Morgan said MIT would send such a manuscript to five or six outside reviewers to make sure the book was “responsible scholarship.” At least one of the readers would be someone who had published in the field, and was representative of the conventional wisdom. Brent, editor of the acclaimed Annals of Communism series at Yale, also asserted the peer-review process would be expanded if a manuscript were provocative, and gave some specific examples, including one instance that involved a book parallel in import to Kaiser’s. The Secret World of American Communism, by Harvey Klehr, John Earl Haynes, and Fridrikh Igorevich Firsov (1995), promised to be a highly controversial work because it showed, using documents from Soviet archives, that the US Communist Party was Moscow’s instrument and involved in subversive activities, including espionage, in the ‘30s and ‘40s. Brent recalled sending the manuscript to as many as eight readers for peer review, including some who were bound to be critical of a book that resurrected “ghosts of the past,” including the Alger Hiss case. There were a “huge variety of opinions about the book,” Brent said, “In the end, we published it.” Even the negative reviews proved useful in evaluating the book’s merits, however. Thomas Jones, “Short Cuts: How to Concoct a Conspiracy Theory,” LRB, 20 October 2005. Jones went on to describe the second rule of stitching together a conspiracy theory: “ . . . in order to hold water it needs to be circular, or rather spiral, so that any criticism can be sucked in and turned into evidence in its favor.” Kaiser also observes this second rule. In his acknowledgments, Kaiser praises HUP for having “always allowed me to write [my books] as I wished.” Kaiser, Road to Dallas, 495. Givler, “Scholarly Books, the Coin of the Realm of Knowledge,” Chronicle of Higher Education. Kaiser, Road to Dallas, 468. YUP’s Jonathan Brent reflected the view of several editors when he questioned the value of soliciting a review from a scholar known to hold an opposite view. Too often, the scholar, “regardless of the merits of the manuscript under review, will attack it,” said Brent, “because it’s impinging on his or her reputation. So what value is that review to me?” Therefore, according to Brent, it’s usually better to solicit a review from a balanced and judicious scholar who does not have a “clear stake.” As a general proposition, this rule seems reasonable. But Brent also said that in the case of a radical book such as Kaiser’s, “that is the kind of subject I would be extremely careful with.” Holland interview with Brent, 27 February 2008. Accordingly, it would seem incumbent for HUP to have obtained a review from at least one reader well-versed in the subject matter and known to hold a contrary view. Even if that review had to be discounted heavily, the criticism would still have shed light on the merits of the book, and indicated whether Kaiser had come close to accomplishing what he claimed. Holland interview with HUP syndic, 8 March 2008. HUP publicity director Mary Kate Maco was quoted in 2000 as observing that HUP routinely turns down books “at all stages,” and that it was “rare,” but not unprecedented, for a book to be rejected at the Board of Syndics level. Stanley Kurtz, “What Harvard Finds Unfit to Print,” Wall Street Journal, 18 October 2000; see also Norah Vincent, “Better Off Wed: Harvard Punts a Conservative Book,” Village Voice, 7 November 2000. Letter to Holland, 3 October 1994. The letter was sent after I had written a review in the Wilson Quarterly that criticized the UC Press for publishing the 1993 book, and privately expressed astonishment that a certain professor was a member of the UC Press Board. When word eventually got back to that scholar, he sent me a letter of explanation. He has requested to remain anonymous. Allen R. Vogt, “The Kennedy Assassination and the History Teacher,” The History Teacher, Vol. 20, No. 1, (November 1986). Though dated, this essay remains pertinent. Although his own work represents no remedy, historian Michael Kurtz was perhaps the first to highlight this oddity in 1982. “Such an event [as the assassination] deserves the serious and careful scrutiny of the scholar,” wrote Kurtz. “Unfortunately, it has not received that scrutiny. For the most part, professional scholars have neglected the assassination, as if it never occurred. This lack of attention has created a vacuum filled by journalists, free-lance writers, and others, most of whom have examined the assassination more for its sensational than for it objective value. As a result, virtually all of the innumerable Kennedy assassination studies have displayed obvious bias and have lacked the careful analysis of objective evidence that characterizes the scholar.” Kurtz, Crime of the Century, lxiv. Cited in Vogt, “The Kennedy Assassination and the History Teacher,” 8. Schlesinger, of course, is as responsible as anyone for mucking up the historical record. In his hagiographies of John and Robert Kennedy, he consistently denied the Kennedys’ responsibility for the assassination efforts against Castro, and falsely depicted RFK as harboring genuine doubts about the Warren Commission’s findings. Holland, Kennedy Assassination Tapes, 423. Kaiser, Road to Dallas, 8.